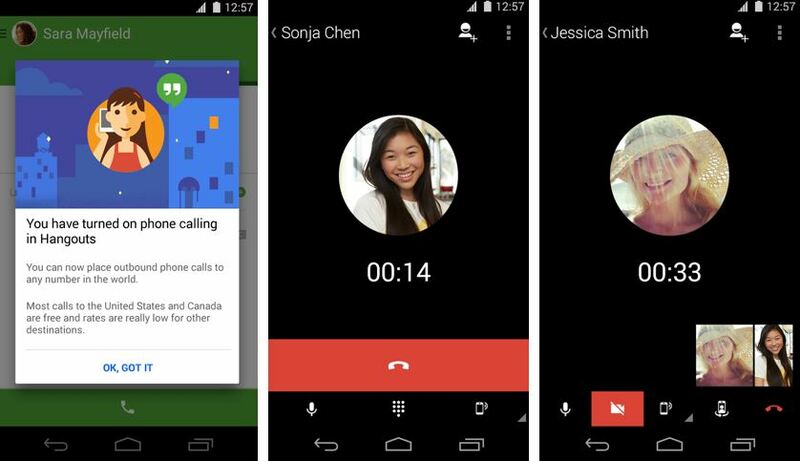 Just a week back Google announced new Hangouts free first minute calling features to some countries and now available to India. This is the promotional minutes by Google. Now you can make free International calls abroad from India with First minute free. Calls with the first minute free are prompted with the Message “First minute free” and if you couldn’t find the message then first minute is not applicable to you. 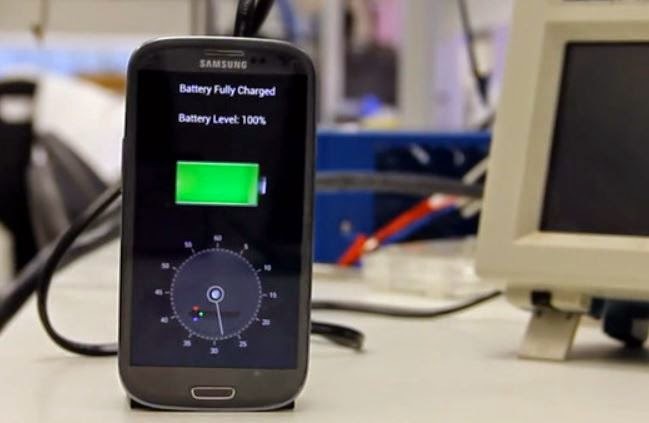 After Using the First minute you are charged with Normal Google Voice call rates. Google Almost allows all the calls to the United states and Canada for free where Hangout calling is available and some of the Canada and US destination cost 1 – cent per minute depending on the Phone number and the 1 cent cost may vary per as per the local currency. Also Check the low Google Voice Call International rates to make calls. So How to Get Free First Minute ? First Free Promotional calling Minute available to the Few countries and Now India is in the List. Add the Google Voice calling Credit to your Account. Call the One of the country among 25 where the first minute is free. View the List of 25 Countries where the First minute free calling is Applicable. Note – If your usage is more and you are making large number of calls a day then some of the calls might not get the first free promotional limits. All the details regarding how to get Google Voice account and Which Mobile Application to use in Android devices, iOS devices and How to use it On Computer through Hangouts is available here – Official Guide. The Hangouts Dialer Application is available at Android Play store and iTunes for the iOS users. This is the best promotional way to achieve the targeted users because competition is going to be hard as WhastApp also going to launch VOIP feature soon and is already iPhone VOIP update is released by WhatsApp. As you know WhatsApp reached huge online users Marks in India recently and company owns the 600 million users. Its the Huge achievement by WhatsApp after it acquired by Facebook. Google is Now ready to give hard competition to WhatsApp and Facebook. Candy Crush Saga is the first puzzle game by the King and it gone viral on the Internet. As it was released people started playing game and Facebook news feed become full of requests and invitations on the game. 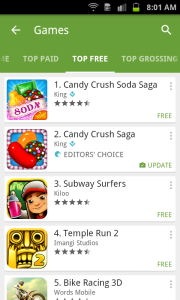 King Launched Saga sequel Candy Crush Soda Saga game just few days back and today the game become the Number one game in Both Android Playstore and Apple Appstore. This addictive game become the leading Free game for Android and iOS devices. 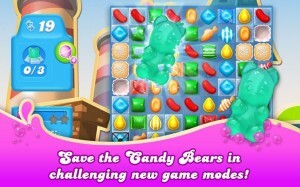 Candy crush saga is the second leading popular game by king. King Posted the 15-second Video of Candy Crush Soda Saga game on Facebook through Facebook Advertising System and it reached 100 million people across seven countries in its first day, Facebook and King said. and this all happens with Facebook Mobile marketing. The reason of this game success is the strategy used by the developers to get more friends is “Ask your friend to get life to unlock the level and users get notified by notification. Also when player achieve the new higher score compare to their friend then it’ll also notified in the Facebook news-feed.” So more and more people gets started by following others and the beauty of the Game is its nicely designed interesting puzzle game and everyone have competition with friends on Facebook which makes the user more addictive. The funda of Game is to request your Facebook friend to get life which allows you to continue play with the next stage. People loved more as it allows to track how their friends playing and at which level they are playing. Game became more and more addictive day by day. One more news is that King Come with just another game named Candy Crush Soda Saga which makes the game more interesting. As we looks inside Saga history, King’s Candy crush saga is launched first for the Facebook Website in April 2012 and then after viewing more players interest King made it available to the Mobile Android and iOS users in November 2012. Meanwhile Other products by king named Bubble Witch Saga and Pet Rescue Saga launched but Candy crush saga is the leading revenue generator game for King. The Sequel game Candy Crush Soda Saga is now at new hike and most downloaded Free Game Application by Android and iOS users. Download the Candy Crush Soda Saga from Android or Appstore and crush the candies with soda. Google has previously announced to fight hard against the Piracy sites like torrents and music sites which contains the copyrighted materials and links and this anti-piracy now kicked in and lots of popular Pirate sites are affected and down ranked in the Google search results. In last few days several popular torrent websites and music sites affected by traffic loss and this Google new search make most webmasters feeling sad because they got losses in organic search engine traffic. Websites providing the pirated infringement material affected by this and loss of webmasters suddenly loss their earnings in just few days. I am feeling the same after this new rolled out algorithm change. I found lots of other webmasters who loss their earnings in last few days. Let me tell you my story behind this Algorithm change. The sites which contains the copyrights materials without permission like download links to the Videos, movies and music for free. Those all the Sites affected by the search engine search and sites are down ranked and also some of the webpages which received the DMCA copyrights notice are demoted and removed from the search engines. Lots of the popular pirate sites like mp3skull and torrent sites lose the search engine traffic. This is the worst feeling for the every webmaster who owns the pirate sites. I personally experienced the same and demoted my website in search engine result pages. I own the Music websites and as you know previously Google ranking well all the websites which contains the Free copyrighted materials and links and sites which are providing direct download links to the copyright infringement contents as music, videos, movies for free were ranking well in the first page of the Google. 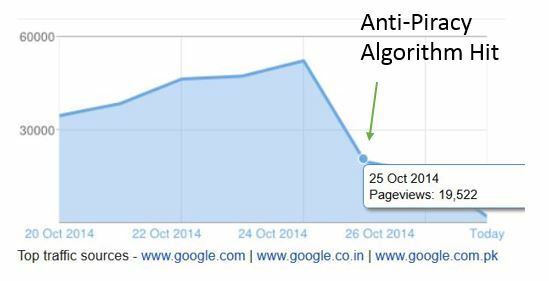 But in past three days my website affected by search engine traffic loss due to this new Google algorithm refresh. I am feeling very sad from last three days because i loss my Organic search engine traffic. Let me give you some detailed stats of my traffic to get more ideas. My site was getting the rapid increase in pageviews daily and i got lots of daily unique visitors through search engine. Look at some of my traffic pageviews stats below. Traffic stats fall down and i feel very sad after this algorithm refresh. Many Website owners feel the same as they are having the infringement materials. Google now started considering the such piracy sites as a spam and down rank and demote such sites from the search results. The sites which are not having such piracy materials are ranking well in the first page even its just the small website. All torrent site free pirated material providers like music, videos and movies loss their earnings in just last few days. Official website which provides the original source of media like iTunes, Amazon and other more ranking on the first page of the google even people type the query related to the piracy content. See the Images below to know how the Popular pirate torrent and music mp3 websites affected. 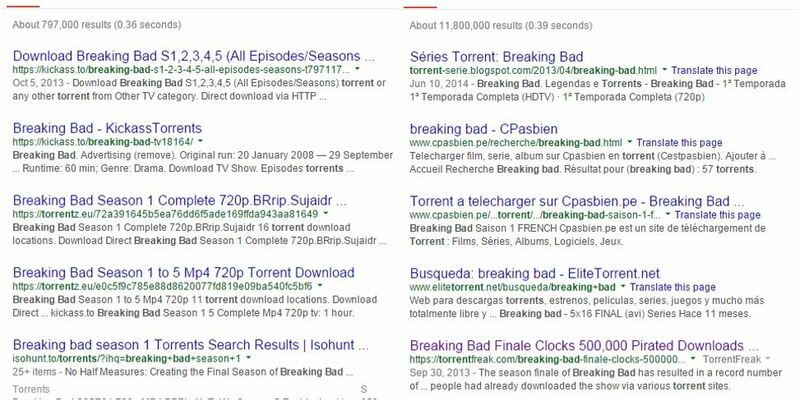 Search query to get the torrent – “Breaking Bad torrent” previously featured the torrents sites like Torrentz.eu, Kickass.to and Isohunt.com on the Top but the scene now goes change. Those all popular sites are now replaced by the less popular site as shown in the below. 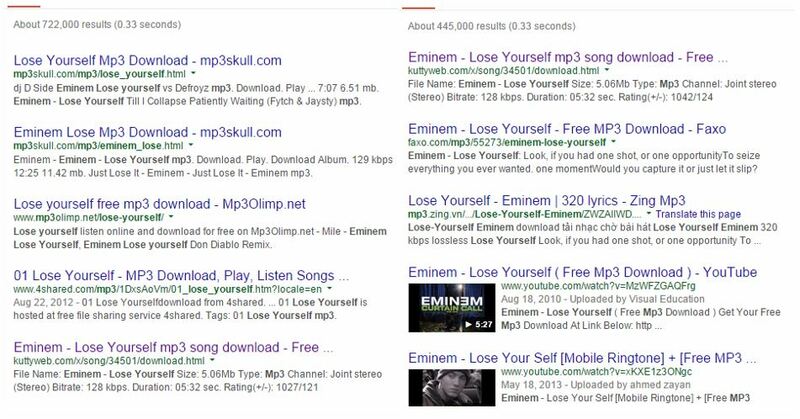 Same way the example query of getting the Free Mp3 Music from the Google By typing the Query – “Eminem lose yourself mp3”. Now the Music search term to get the free download link also affected. Popular Music website Mp3skull.com affected and lost the organic traffic as shown in Image below. Look in the Search result Old and new and see how other less pirated sites ranking well in the search engine compared to the Popular site “Mp3Skull”, “4shared”. Now people struggling to get free media materials online. Due to that new Google Algorithm refresh lots of webmasters loss their Advertising earnings. My Music Mp3 website also affected as i shown in the previous traffic stats. I am also feeling the frustrated from last few days because i lost my organic traffic to media music site. Now Google started showing the Genuine and lesser pirated sites in the top 10 results. Now people who really wants such media contents for free started using the Other search engines to fit their entertainment needs. Do you own the pirated site and how you are affected after this new google Algorithm Anti-Piracy refresh. Really excited to hear from you. This month Google updated its Search Algorithm to show the results in the search Engine Result pages. In the Past few years Google company had received millions of DMCA Copyrighted page removal notices from the copy rights owner industries. They were managed to remove all the Piracy links from the search engine results as quickly as possible but it was not effective and allowed other pirated sites related to movies, Music and games to rank better than the official copyrights owners sites. Due to that reason Google Planned to make changes the way results displayed on Infringing piracy materials on the Internet. 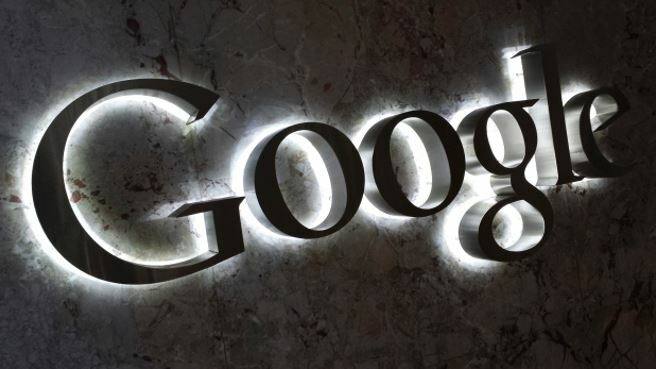 Now Google Planned to play nicely with copyrights holders. See the Strategy of Google on How Google Fights Against the Piracy [pdf]. I have experienced this changes in search result of Putting down the sites which leads to Piracy related material. Google also testing the several ads and how its to be displayed when the People search for Phrases related to the Entertain. Suppose you search for the Music Album then it’ll pulling down all the pirated links to the bottom of the page and the top results would be the iTunes, Amazon or any other genuine copyrights owners stores. So now one good news it that the Google made the search engines results more Copyrights friendly and now they don’t need to handle much DMCA page removal requests from the copyrights holder. So google finally decided to demote sites in the search engine rankings that have received the large number of DMCA page removal notices. All those sites with high number of removal notices displayed down to the search results and which helps peoples to find the legitimate materials easily. when people searched for the Movies for free then they used the Term like “Fast and furious 4 torrent”. So they are used to download the Movies from the sites which are infringing the copyrights. So Google rolled out the new changes to show the ad results on the top of the Google first page from the legitimate sources of media. They have tested it and glad that lots of search traffic leads to the Genuine copyrighted holder sites. This summer the movie Expendables hits the majority download from the torrent before the theatrical debut. People downloaded the high quality movie from the pirated sites because they have searched the query like “Expendables torrent” or “Expendables Download”. “While relatively few users search in this way compared to root queries like ‘expendables,’ we are happy that these new ad formats are driving traffic to legitimate sources of media,” Google said. Now Google will try to remove the autocomplete suggestion from the Piracy sites. Suppose you require audio album or movies from the Pirated site then you simply type the query in the Google related to that content with site name as “X man Download torrent”. Here we took example of torrent but people used to search by typing query of site which they find useful but pirated and Google stores all the search teams which are most likely searched by the users on the Internet and maintains the Database. Then it shows that most searched query or phrase in the Google Autocomplete. But now Google will remove such Pirated search queries from their database such that users only displayed the more genuine results in the search terms First. This way Google enhanced “Autocomplete” and “related search” function to prevent terms that associated with Piracy. Lots of people around the globe like me and you always prefers to get contents free on the Internet like movies, Album music, Games, Books and much more even they redirected to Pirated site. They don’t care about the any other harm or damage they just want the things free only. So after this Google update they won’t be able to get more accurate results in the search results from the Pirated site. So the peoples really wants it from pirated site as a free will remember that site or follow that pirated source on the Social network to get free materials. Many users already shifted to different search engines to get the thing of their choices. Because nobody want to pay for the online materials if its available as free. What you think about this new refresh to Google Search Algorithm. Let us know in the comment below !